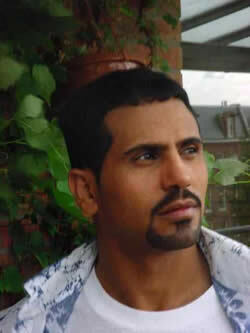 Mogib Hassan was born in 1974 in Yemen. He has dual Yemeni and Dutch nationality. He holds a Masters Degree in International Relations and Globalisation from London Metropolitan University. His work brings together classicism and the contemporary with a critical perspective on society and the position of women, blending personal themes with broader political issues. During 2005 Mogib moved to London to meet new opportunities and to engage in the city’s rich cultural and political life. During this period he made some public appearances in poetry cafes and other poetry events. Besides his poetry Mogib is also a song writer and a singer of mainly his own material. During recent years he has been published both in Dutch and English in a variety of journals, magazines and anthologies. He has also toured extensively and recently recorded some of his poems for a filmed documentary about women’s rights. His latest released works include two CD’s – one called ‘Songs from Guantanamo’, the other a recorded collection of his poems called ‘Oh Life’. Also a collection of his poems called Close Up from Far Away has been published by Exiled Writers Ink in cooperation with London Arts Council. The launch took place at Amnesty International in April 2008. Mogib regards poetry as his romantic, angry and tender voice to the world. He says “It is my helpless and powerful sigh. Poetry is my form of revolution and my open embrace to passion”. One of Mogib’s concerns has been cultural clashes resulting from misunderstanding between the East and the West. With objectivity and logic Mogib tries to create a meeting of civilizations instead of a clash of civilizations by highlighting the positive aspects of both cultures. Yet a thoughtful criticism of both cultures is also present in his writing. Mogib is a human rights activist who has been involved in several projects with Amnesty International UK, Reprieve, The Center for Constitutional Rights in USA and Hood, the first human rights organization in Yemen. He was also involved in organizing, reading and singing at an international conference held in Yemen in January 2008 opposing the US’s Guantanamo Bay policy. The purpose of the conference was to encourage the Yemeni government to press more actively for the release of its citizens from Guantanamo and to address human rights issues in Yemen and worldwide. He was also involved in organising and reading at another conference in Yemen in January 2008 for the same purpose. The Fonds voor de Letteren, (Dutch Foundation for Literature) selected him in 2003 as one of its international authors of merit. In the collaborative project World Podium, Mogib and five other poets anchored a tour of verse together with local musicians in six Dutch and Belgian cities in October 2004. An anthology, The Silver Throat of the Moon, published by Five Leaves Publications, Nottingham, includes a poem by Mogib. More poems were published in 2006, and he participated in readings at some events. As he has always been passionate about acting and singing, Mogib has taken part in several stage performances in Yemen, Europe and India, and was given a small role in the opera The Rake’s Progress directed by Peter Sellars at the Dutch National Opera, Amsterdam. In 2005 he was part of the Exiled Artists Arts-In-Education project run by the Lyric Hammersmith (GLYPT), which included a placement for a course at Oval House, a young people’s theatre. Part of this course included organising workshops at secondary schools. In September 2007 Mogib took part in the first Poetry International Festival in Paris, France. This event brought together poets from all over the world to campaign for peace. The festival issued an anthology ‘Ground of Poets, Ground of Peace’ in which some of his poems were included. Mogib is now involved in several intercultural and human rights projects. One of these is the Poetry Film Festival to take place in Berlin in June this year, and others are the establishment of an office in Yemen for an international human rights NGO, and organizing intercultural Musical events for NGOs in the Netherlands and Yemen for the benefit of children with difficulties in Yemen. why choose me from the crowd? And still I kept patience with you. and began to repair the broken bridges. you made a great calamity.